So you’ve collected feedback from your customers now your customers want to know what you’re doing with all that data. How do you show your customers what you’re doing with their feedback? This is a really important question because we know from our research and experience that if you tell customers what you’re doing with their feedback and demonstrate to them that actually something’s happening within the organisation, that will increase their customer loyalty but it will also make them more likely to provide feedback in the future with you, which is what you really want. So how do you provide that information about your customers?It depends. 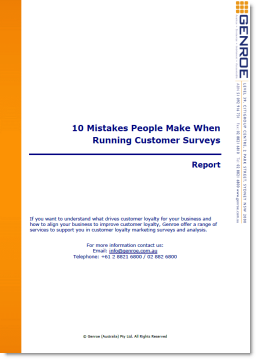 In a B2B organization, you could do something very simple: Create a short report. Create a short summary of the feedback from the customer survey that you’ve taken or the customer feedback process that you’ve undertaken. Tell them in that feedback what the actions are that you’ve undertaken. And then quite simply go out and talk to senior members of your clients’ organisations. Go out and show them what you’re doing. Show them what you’ve heard. Show them what changes you’ve made in the organisation. You’ll be amazed at how much customers love to do that. In a B2C scenario, you can do something a little bit different because it’s very hard to go to every customer. You can put something into your blog. Write up a quite simple summary; make sure it’s publicly acceptable so that there’s nothing confidential that’s going into the document. But then put it out on the website. Put it out on your blog. Put it in your email newsletter. Tell customers what you’re hearing from them and tell them how you’re making changes. This has some really important ramifications for the organisation. If you go out and tell customers how you’re changing, they’ll become much more engaged with your brand. If they’re more engaged they’ll be more loyal. The other thing is staff love to see what’s happening and staff love to understand and hear what’s happening in the organisation about how change is being driven from the customer feedback that’s being collected. So by doing this simple task, going out and telling customers what you’re doing you get two benefits. One benefit is customer engagement and increased customer loyalty. By the way, they’ll also provide more feedback next time you ask them because they’ve seen what you’re doing with their feedback, they’ll accept that you’re using it, and it’s valuable to you, and that they’re actually making a change. So they’re willing to invest that time in you. And from the employee engagement, they’ll see how you’re making change from the customer feedback. They’ll become more engaged with the business. So that’s today’s question. If you have any other questions about customer feedback or the customer feedback process, please email us at questions@genroe.com.au. Thanks very much.